Children have immense imagination power! Unleash them now at our Artsy Craftsy art class! You will be amazed at what your child can do! It’s not about how well they can draw. It’s how well they can relate their experiences and knowledge, bundled with their imagination power and creativity to create a masterpiece that they can call their own. 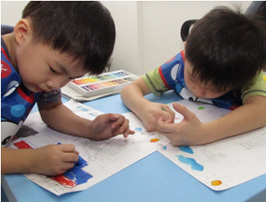 Programme aims to build child’s confidence in expressing themselves through doodling , art and craft, oral and written presentation of their masterpieces. Copyright 2019 My Creative Kids. All right reserved.